by Linda Jean Shepherd, Ph.D.
My love affair with plants began on my sixteenth birthday, when my friend Joyce gave me a philodendron. I admired the seven glossy, heart-shaped leaves trailing from the little white pot and reverently placed her on the windowsill above my bed. As I poured water into her rich black soil, I whimsically baptized her "Weed." I imagined her birth in the steamy jungles of tropical America, where she attached herself to a tree and climbed to prodigious heights. Weed was the first nonplastic plant to enter my family's home in Pennsylvania. Unlike the Japanese dolls and ceramic animals on my bookshelves, Weed was alive. I celebrated each new leaf. By the time I graduated from high school, she covered my bedroom window in a luminous green weaving. She has been a more constant companion than any family member, lover, husband, friend, or pet. I keep marveling at how she creates so much green beauty from the meager dirt in her pot. Weed accompanied me to college. When I needed to decide on a major, I sought inspiration in my tree-house refuge. There I decided that what I most wanted to know was how plants work-how the xylem and phloem transport nutrients, how chloroplasts capture light and make food. It felt as if the knowing would bring me closer to them, and so I majored in biology. But in the process of my training, I was waylaid onto the path of science that looks at smaller and smaller parts of nature. I earned a doctorate degree in biochemistry, with a minor in physical chemistry. Daughter-of-Weed sought out light amid the reagent bottles and experiments on my lab bench, while Weed presided over my studies at home. By now, she had many cousins, including an unruly purple-passion plant and a cascading spider plant. Various shades of green pervaded all my living and working spaces. Weed witnessed my marriage and accompanied me to my first job. When my husband and I separated, and I took a job with a biotechnology company clear across the country, I carefully boxed up my plant family-despite the dire predictions and disclaimers of the movers. I couldn't leave my green sisters behind. While I flew to Seattle and found a place to live, they traveled in a moving van through the winter cold of Montana. They arrived in Seattle with blackened leaves, almost dead and certainly unattractive. But they were my family. So, holding on to hope, I patiently tended them. They had always given me solace. Now it was my turn to talk to them, encourage them, and cheer them on when I saw the first glimmers of green. Over the weeks and months, their beauty gradually returned, and Weed's heart-shaped leaves unfurled. Again she thrived. One day the director of quality control asked me to remove Daughter-of-Weed and her cousins from my office. She feared they might harbor fruit flies, which could contaminate the monoclonal antibody products in the manufacturing rooms across the hall. Somewhat to my surprise, the first thought that sprang to mind was: If my plants go, I go. I dug in my heels in silent, passive resistance. We both stayed. At that point, I realized I needed plants around me as much as I need air to breathe. Though I rarely talk about my feelings for plants, they are intrinsic to my nature-as much a part of who I am as my long hair. My bond with them is a given, a foundation for my life. I require their beauty and tranquillity for inspiration-in all senses of the word, since plants literally give me my life breath, oxygen. While I was developing biotech health-care devices, I read about a new Weyerhauser product: Inscape Interiorized plants and trees-real plants that had been fed a liquid plastic that polymerized inside the plant and essentially embalmed it. "No mess, no maintenance," the advertisement said. "A revolution in interior landscaping. This forest thrives without light, water, or even soil." I read the advertisement over and over, unable to believe my eyes. Was this better living through chemistry? What could motivate anyone to undertake such research? Why would anyone want a plant that could not offer the joy of watching it grow? "They're still beautiful," a friend said. "Human skin makes lovely lampshades," I replied. Without Weed's growth, her abundance and generosity-her messiness-I never would have had the pleasure of sharing her with other humans. She and her green cousins have made a living bridge to many friends' homes, offices, massage studios, and dojos. At the same time, I know that plants themselves thrive on companionship with their green cousins. For example, Russian peasants appreciated the value of the "noxious weed" cornflower (also known as bachelor's buttons) growing in a field of waving rye. They had observed that rye grew better with her blue-blossomed cousin than alone. To honor this compan-ion-ship, Russian peasants decorated the first sheaf of rye harvest with a cornflower wreath and placed it in front of an icon. Similarly, one oxeye daisy amid a hundred wheat plants promotes growth of the wheat. Further experiments have shown that a ratio of twenty daisies or cornflowers to a hundred crop plants crowds out the sprouting crop. But in limited numbers, such "weeds" bring minerals up from the subsoil and create root highways that enable crop-plant roots to dive deep to otherwise unavailable food. Weeds are usually undervalued-or seen as the enemy. In the competitive world-view of agribusiness, herbicides eliminate weeds that compete with crops. As a woman scientist, I love to learn about research that demonstrates how weeds cooperate with crops and form community. Researchers at the University of California at Santa Cruz studied the traditional Mexican farming practice of pruning back, rather than pulling, a weed that commonly sprouts between rows of corn. They found that the roots of the weed, Bidens pilosa, secrete compounds lethal to fungi and nematodes that destroy corn. Instead of competing with the corn, the weed controls the pests without significantly stealing soil nutrients from the corn. The practice protects the soil and provides more wholesome food. The weed gets to express its nature. That, I believe, is what Earth asks of us: for each of her creatures to express her unique nature joyfully and exuberantly. From my sunny condominium in Seattle, Weed and I moved to a house in an acre of young forest on Tiger Mountain to be with Paul, who became my second husband. We suspended Weed from the beam of the cathedral ceiling in our living room. Her scant six-inch yellow pot disappeared behind her shiny leaves. Abundant leafy tendrils climbed up twine macramé to the skylight, while others trailed down the wall to wander amid a Navajo wedding basket and Hopi kachina dolls on a shelf before cascading to the floor. Paul and I had selected the house partly so we'd have minimal outside upkeep. Then I discovered that I could not resist planting and co-creating with the plants. Over the past ten years, my garden has become a conversation with nature about living beauty. When a huge decaying cedar stump fell on its side, I filled a depression with dirt and planted a weeping Japanese maple and fuchsias in it. When an ice storm felled hundreds of fir, alder, and hemlock branches, I wove them together to create a long flowerbed along the side of the road. My gardening style is to respond, rather than to bulldoze plants and impose an abstract landscaping plan. I'm happiest when I'm making use of what's around. I heap together weeds and fallen leaves until, over the years, they magically become the rich black dirt of a new bed. Split logs edge trails filled with chipped branches. I build rock walls from stones uncovered in planting shrubs. Reveling in a sense of abundance and resourcefulness, I feel the satisfaction of nurturing and bringing order to all the forms of life in the garden. When a space in the garden opens up, I'm led by desire. Plant lust. Pictures in seed catalogues seduce me with their promise of beauty. I imagine lush colors attracting bees, butterflies, and hummingbirds. Emerald temptresses in nurseries lure me with their fragrance of lilac and lavender, honeysuckle and spice. I'm captivated by descriptions of fruit that can't be found at the supermarket, such as native American pawpaws, which produce yellow fruit whose pulp tastes like vanilla custard. Hesitant to force my will, I'm reluctant to prune. I'm too curious to see what the plant will do on her own. I want to learn about her habits. Yet browsing-pruning- stimulates growth in plants such as sage or rosemary. I'm still coming to terms with weeding. "A weed is a plant out of place," I learned in ninth-grade biology. Usually, "weed" carries a negative connotation, implying a plant that is unsightly or a nuisance. But, ecologically, weeds are pioneers, colonizers of open habitats-healers of land disturbed by mankind. "Very successful life forms," as Star Trek's Spock would say. It is only our egotistical human point of view that labels a weed a weed. When viewed as a functioning part of nature, weeds have much to teach. They are excellent indicators of soil conditions. Sorrels, docks, and horsetails are a sign that the soil is becoming too acidic. Far from being harmful, plants such as ragweed, pigweeds, purslane, and nettles bring up minerals from the subsoil, especially those that have been depleted from the topsoil. As companion crops, they help domesticated plants get their roots down to food that would otherwise be beyond their reach. Dandelions actually heal the soil by transporting minerals, especially calcium, upward from deep layers, even from hardpan. Having grown up feeling like an outsider, I have an affinity for weeds-which is how Weed got her name. I've admired their robustness, their ability to thrive in harsh conditions. They are wild, uncivilized, untamed-free-the American ideal of rugged individualism. Old-growth forests, on the other hand, are the climax of a community of wild plants who have learned to live together. As I grow older and seek more intimacy and community, I realize that many weeds are symptomatic of imbalance. Some weeds act to heal the soil, but others haven't yet learned to live in their new communities. Like rats, cockroaches, and starlings, they are uninvited guests in niches carved by humankind. Most Northwestern weeds were brought intentionally or accidentally from Europe or Asia. For example, purple loosestrife is a valued wildflower in her native Eurasian habitats, where her patches are kept small by a complex society of insects and animals feeding on her leaves and seeds. But in North America, she crowds out native species and chokes waterways. And so I pull wild geraniums and blackberry vines that run rampant over more delicate trilliums and bleeding hearts because I love diversity. I want to create a balanced community in my garden. Now, to my delight, I'm finding uses for some overly rambunctious-generous-plants. I've perfected a recipe for dandelion-chive quiche. Sweet woodruff scents my living room. I keep lemon balm and comfrey in check by harvesting leaves for tea. And Weed travels to ever more friends-an ambassador of the plant world. Since plants are sessile, peaceful-undramatic-they rarely make breaking news. They set boundaries with thick skins and thorns. They infuse their leaves with unappetizing tannins to protect themselves from overgrazing. They protect themselves, but they don't intentionally cause harm. As a child, I always sought out the comfort of plants after a family dispute. I sat high on an old log in the woods and felt the forest embrace me. As I entered the contemplation of trees, I felt soothed. My perspective broadened and deepened like the branches and roots of the trees around me. In fact, I'm not alone in seeking the solace of trees. Recently, researchers at the University of Illinois found a correlation between safety and trees, which appear to have a calming effect on city dwellers. At tree-lined housing projects, children play more creatively, parents are more sociable, and adults report dramatically fewer incidents of domestic violence. The researchers concluded that trees are as necessary to urban life as streets, sewers, and electricity. I was not surprised to learn that, in contrast to the prevailing competitive, survival-of-the-fittest, Darwinian conception of nature, plants also practice charity. A study done by a group of researchers in British Columbia showed that well-fed birches shared their bounty of sugar with nearby undernourished birches. Underground fungi transfer nutrients between plants via their roots. Disconnection from plants and the natural world can lead to everyday evil, usually with the best of intentions. "Clearing the land" is equated with progress, with civilizing. A gardener cuts down hemlocks and cedars to grow lettuce. Ancient forests left uncut are deemed "wasted." Trees mean lumber. In mankind's narcissism, a view is worth more than a living tree. How do we arbitrate such divergent value systems? I wonder. Who speaks for the plant world? How can I become a better guardian? When I hear accounts of war, battles, and bombings, I mourn the slaughter of innocent plants and animals as well as I do the people who die. Napalm denuded the jungles of Vietnam. Meadows of wildflowers decimated by tanks and grenades leave rabbits and foxes to starve in the muddy wastelands left behind. Atomic testing obliterates every plant, every seed, within range. The Gulf War killed even the most tenacious desert vegetation. Yet few mention the cost of war to the land. Even in times of peace, the violence continues. I look away when I drive past clear-cuts; sometimes it feels easier to deny the sacredness of all parts of the natural world than to feel the distress of its ruin. Recently, I was shocked to read a report by the World Conservation Union that said that 12.5 percent of the world's seed-producing plants and ferns-nearly thirty-four thousand species-are endangered. In the United States, some 29 percent of plants, or sixteen thousand species, are at risk of extinction because of loss of habitat and competition from nonnative species. In a statement to the press, a representative of the New York Botanical Garden observed, "Every nation understands and appreciates its biotic wealth much less than it does its material and cultural wealth. Ironically, it is precisely the biological assets that are most at risk." The rate of extinction is being exacerbated by agribusiness. Philip Abelson, editor of Science magazine, contends that "the greatest ultimate global impact of genomics will result from manipulation of the DNA of plants." He predicts that most of the world's food, fuel, fiber, and chemical feedstocks, and some pharmaceuticals will be obtained from genetically altered vegetation and trees. Major companies including Dow Chemical, Du Pont, and Monsanto are now spending billions of dollars annually on genetic engineering. Already, they have succeeded in their highest priority-creating crops resistant to their proprietary herbicides. With research financed and motivated by sales of the highly profitable herbicide Roundup, Monsanto has genetically altered soybeans, cotton, potatoes, corn, and other plants. Sale of these seeds has been expanding rapidly since the federal government approved the first biotech crop for commercial planting in 1992. Over fifty percent of the soybean seeds planted in 1999 were herbicide-resistant. Such Roundup Ready varieties mean that farmers can apply more herbicide to their crops-our food. This continuing trend toward chemically intensive agriculture degrades our soil, water, air, and health. As more herbicides find their way into our bodies, our health declines-even as it fosters the economy, since we then spend more money on pharmaceuticals, doctors, and hospitals. We now eat "virtual" food, devoid of nourishment-and then buy bottled water, vitamins, mineral supplements, fruit-ceutical and vegi-ceutical caplets, and additive-packed Ensure drinks and energy bars. With increased reliance on genetically engineered seeds, the diversity of naturally growing varieties is being lost. Fortunately, devoted gardeners are striving to maintain viable banks of heirloom seeds, sponsoring seed exchanges and even expeditions to collect and preserve vanishing varieties. In contrast to seeds from plant hybrids, which are unpredictable and sometimes sterile, heirloom varieties can be pollinated through insects, wind, and water to produce offspring with reliable characteristics, allowing seeds to be saved and grown out year after year, generation after generation, without herbicides, fungicides, or pesticides. In April 2000, a National Academy of Sciences report confirmed that crops engineered to contain pesticides might produce unexpected allergens and toxicants in food. In addition, they have the potential to create far-reaching environmental effects, including harm to beneficial insects, the creation of super-weeds, and possibly adverse effects on soil organisms. Yet these environmental side-effects have been virtually unstudied. In response to consumer protest, a hundred and thirty nations signed a treaty that would allow any country to ban the import of genetically altered foods. Now many food processors and farmers are shunning genetically engineered crops, and Monsanto is considering abandoning its business model that combines pharmaceuticals and agricultural products. As I work in my garden, I continually ask myself: How can we, as humans, help our plant companions to express themselves most fully? How can we create more life by cooperating with weeds and bugs-by allowing them to do what they do best-rather than killing them with herbicides, pesticides, and fungicides? During a three-week herbal apprenticeship in wise-woman tradition, I saw how much life could be woven together on less than an acre of land. Chickens scratched the ground, trimmed and fertilized the grass, ate kitchen scraps, and laid eggs. Ducks grazed on slugs and fertilized the strawberry patch. Rabbits ate dandelion greens and provided meat. Goats ate invasive blackberry bushes and gave milk. Worms, bugs, fungi, and bacteria filled the soil with life. We humans harvested weeds-chickweed, bittercress, shepherd's purse, and lamb's- quarters-for our salad, and prepared medicinal tinctures from cleavers, yarrow, and Saint John's wort. We invited bacteria and fungi into our bodies by eating foods such as goat cheese, yogurt, miso, fermented tea, and dandelion wine. Now that I was better able to see the interconnections within the web of life, it made perfect sense to me that research shows that high-frequency sound-in the range of birdsong-opens the stomata, the pores, of plants and increases the flow of nutrients. I began to learn about the wise-woman tradition of healing, which honors a bond between women and plants that spans millennia. Often the medicinal plants were what we call weeds. Women used Saint John's wort oil for healing burns, and her tea for a diarrhea remedy; calcium-rich horsetail healed bone fractures and cleansed the urinary tract; plantain made a poultice to soothe bee stings, and her seeds provided a laxative. Since each plant treated a variety of ailments, the forests and meadows provided an entire pharmacy. Only in the past year have I experimented with eating wild plants. Mineral-rich stinging nettles and deep-rooted burdock are deemed impractical for mass cultivation, but are freely available in wild places. By narrowing our experience to sweet and salty tastes, we miss the tonifying bitterness of dandelion leaves that wakes up our digestive system. We forget the pungent zip of gingerroot and anise seeds. In isolating (and patenting for profit) single "active ingredients" of plants, we lose the ameliorating and balancing effects of the plant's multiple components. For example, meadowsweet, whose "active ingredient" is methyl salicylate, heals damage to the stomach wall because of the combination of mucilages and tannins in the whole plant. Yet salicylates alone, such as aspirin (named for the old botanical name for meadowsweet) are known to cause stomach bleeding as a side effect. In our commercial culture, gathering dinner from the wild has somehow become associated with poverty. Yet to me it provides joy, grounding, and an intimate connection to the earth and her seasons. During the salad days of spring, I watch to catch peppery bittercress before she goes to seed, and nutrient-rich lamb's-quarters while she is tender. I eagerly await the blooming of calendula, impatiens, and red clover to adorn my summer salads. 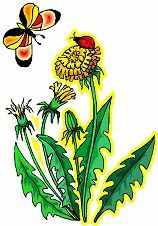 I graze on plantain, chickweed, and miner's lettuce as I garden. When the nip of fall crisps the air, I notice my body asking for root stews. Surrounded by the bounty of the forests and fields, we no longer know how to survive without a supermarket. We've forgotten that honeysuckle flowers are sweet and delicious, plantain is palatable and nutritious, and Oregon grape leaves and flowers are lemon-tart. Wild foods bring wildness into our bodies. Through my connection to Weed, I grew sensitive to other plants as well. While Paul notices the Jaguars and Ferraris on the road, I relish the first blush of willow green and the spare winter skeleton of a maple. Watching for patches of yellow Saint John's wort to harvest, I practice my sixty-mile-per-hour botany. I try to remember when and where I saw a linden tree's fairy blossoms last summer. I wonder if the bankers will chase me away if I harvest leaves from the ginkgo tree in their parking lot. We take plants for granted; yet they give us life. Weed and her cousins give me the air I breathe; they give me their fruits, seeds, and bodies to nourish my body. Their beauty nourishes my soul; their flesh becomes my flesh. They fill me with a sense of abundance. From next to nothing-simple carbon dioxide, water, nitrogen, and minerals-they alchemically create huge, beautiful, complex, intricately adapted structures. The cathedral hush of a redwood forest. The sensual cinnamon bark of madrona. The voluptuous iris. I marvel at their mystery. I am grateful for their generosity.